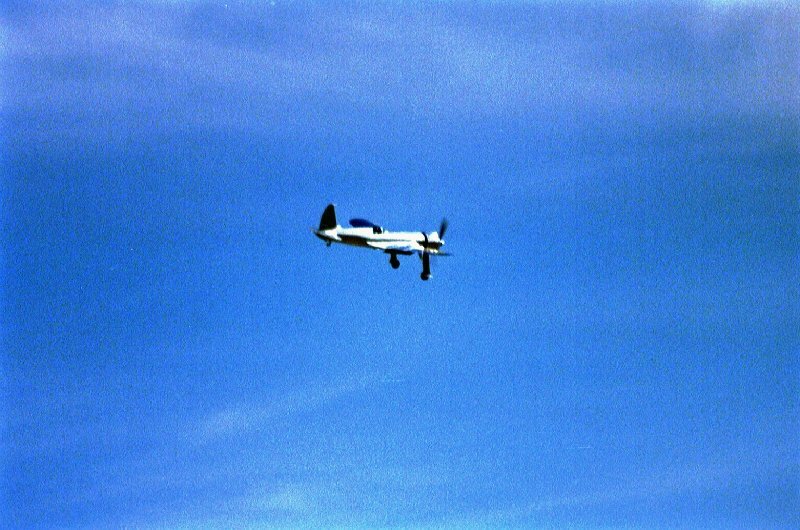 The later winner of the Rolls Royce Heritage Trophy, Captain Eddie Kurdziel, arrives with his Fairey Firefly at Stead Airfield. 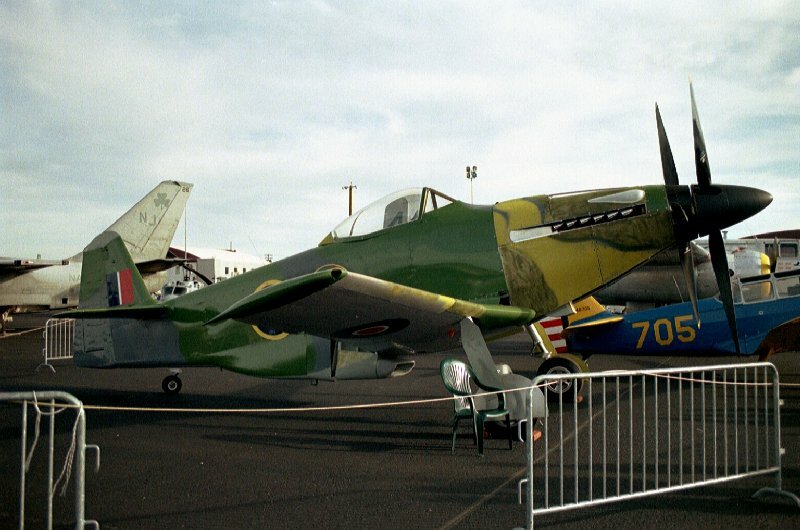 Only two of these aircrafts are still in a flyable condition. 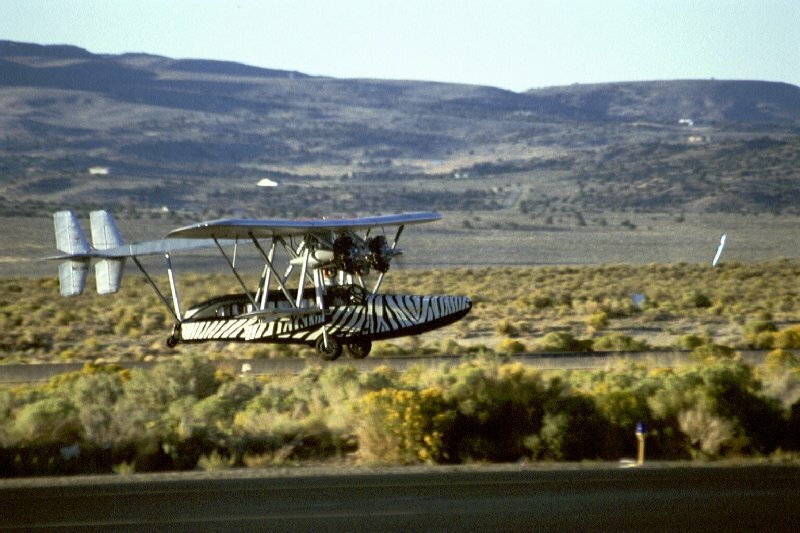 This exotic amphibian plane is a replica of the Sikorsky S-38. 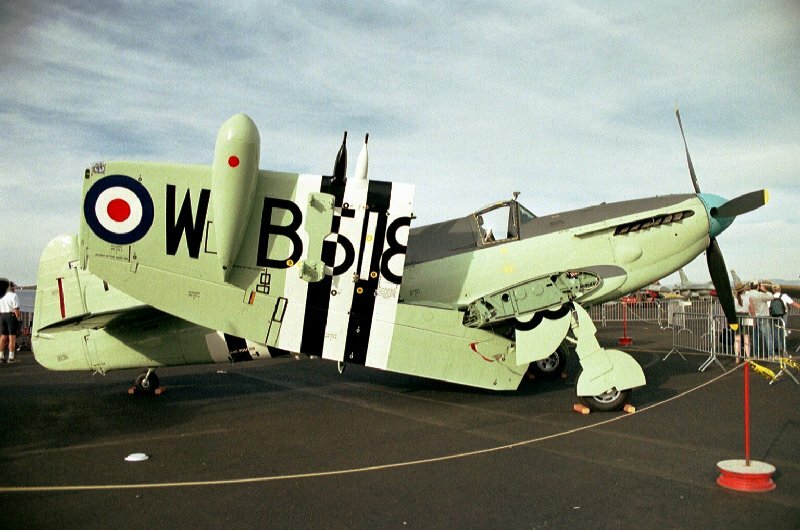 Unfortuneately this interesting plane was only paying a short visit and couldn´t be seen in the static diesplay. 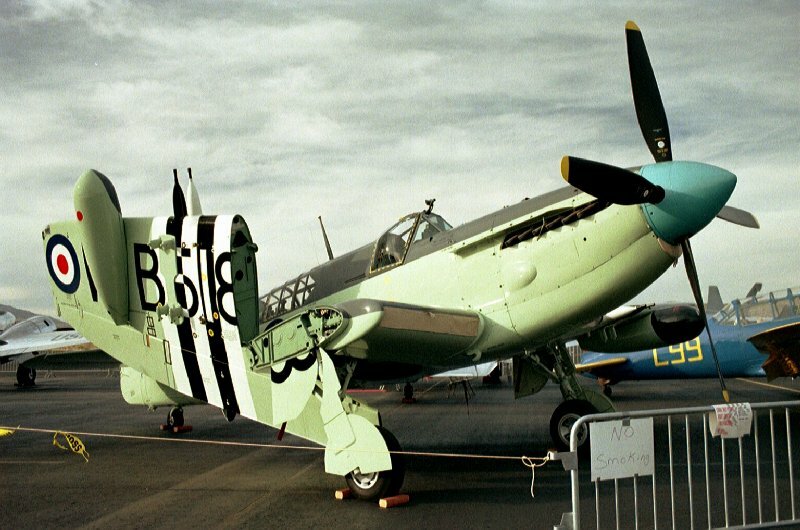 The folding wings hint to the fact that the Firefly was used on aircraft carriers. Actually the Firefly was used in various service roles after her maiden flight in the December of 1941. 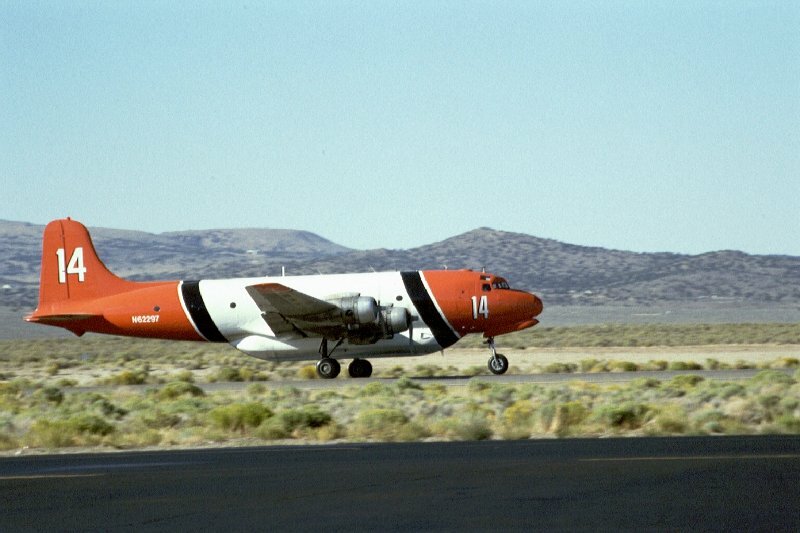 This beautiful Douglas DC-4 Firefighter didn`t belong to the show either but is a good example for the great variety of aircraft types at the Reno Races. 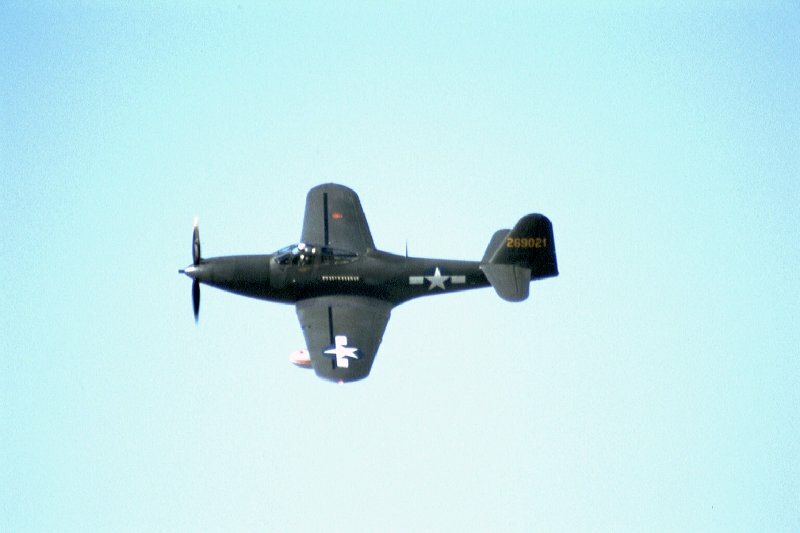 After the end of WW2 the Firefly remained in service until 1956 among other things in the Korean War against naval targets assigned to various aircraft carriers. 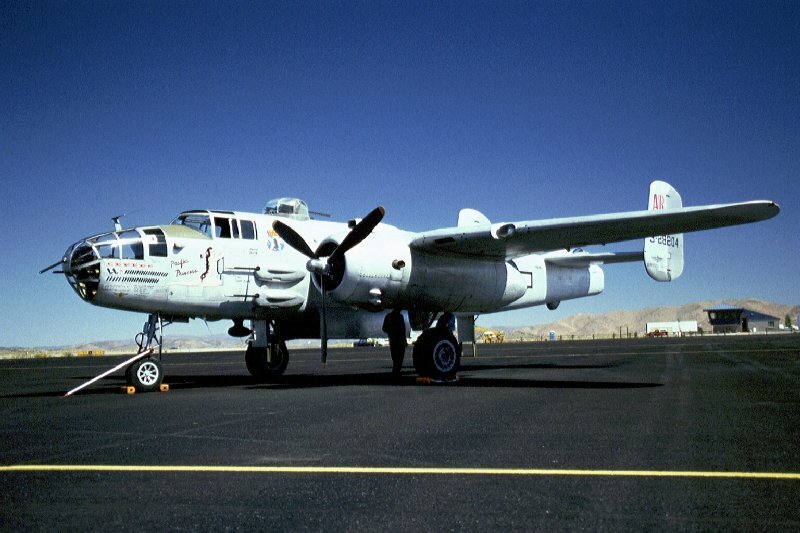 Wordlwide less than 50 flyable Vultee BT-13 "Valiant" still exist. Not many regrading the fact that 11.537 aircraft were built. 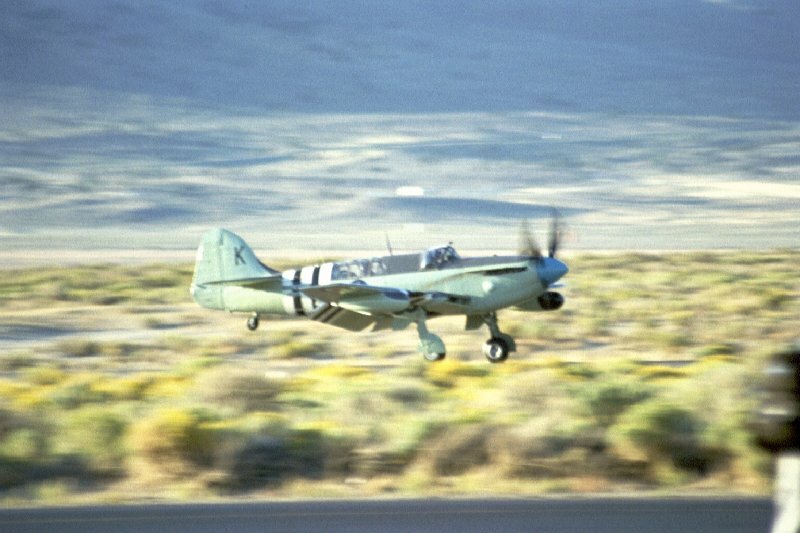 The BT-13 was the basic trainer for the Army Corpy and the Navy. A truly impressive plane in front of an impressive scenery due to a sandstorm that passed Reno on Sunday. 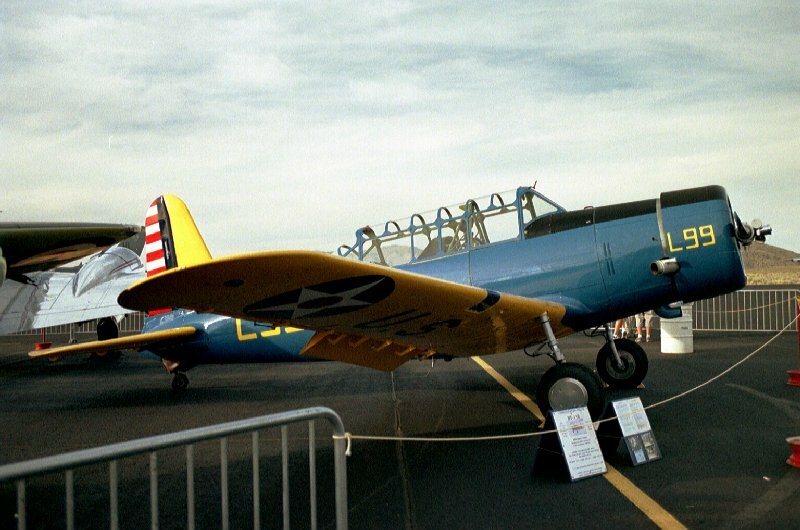 The flying career of a fighter- or bomber pilot most of the time began with the "Primary Trainers" as the Boeing PT-17 Stearman and via the BT-13 to the North American AT-6/SNJ Texan. This close up shows the loving effort that is put into the restoration. 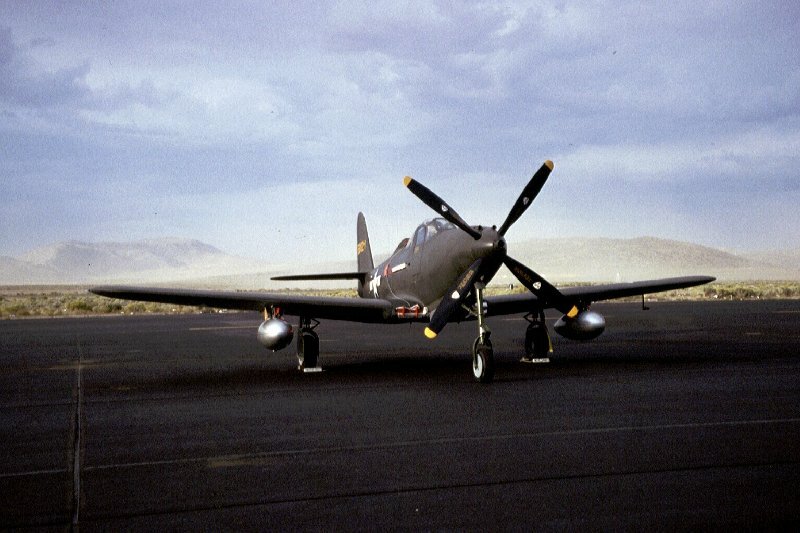 The distinctive mark of the Bell P-39 and the P-63 is the "center" engine located behind the pilot driving the propeller via a driveshaft. 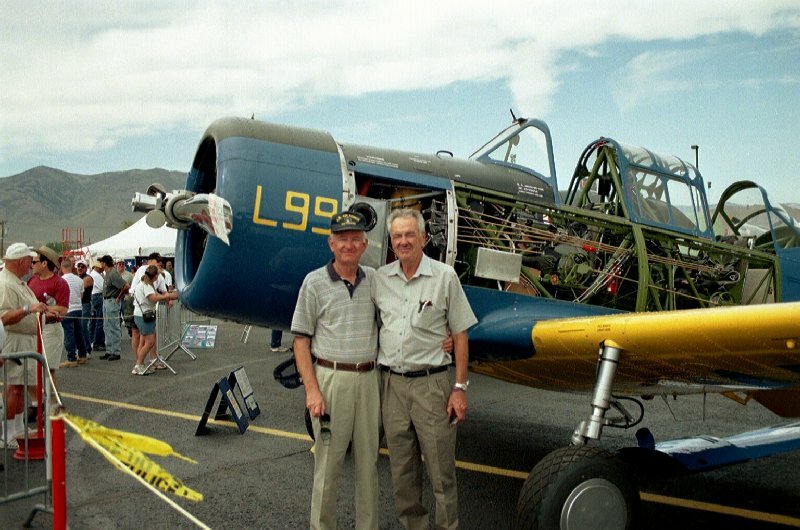 It took 5 1/2 years to restore the BT-13. Lloyd Ticher (right) together with his partners Miller, Hunt, Kunkel, Benson and some more helping hands did a wonderful job and in January 2002 the FAA gave its approval. 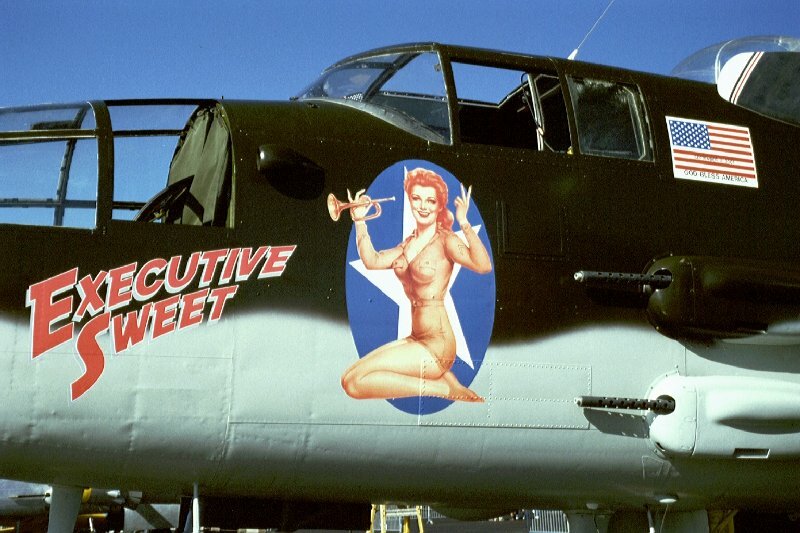 A very colourful Nose Art carries this B-25J "Mitchell". Takeing a closer look at the 12 machine guns, calibre 12,7mm, makes the bare teeth look more appropriate. The prototype of the Baker MB5 was presented in Farnborough / UK in 1946. But even with its impressive flight characteristics it never saw series production - the era of jet aircraft had just begun. The only replica of this type is now close to it`s maiden flight. 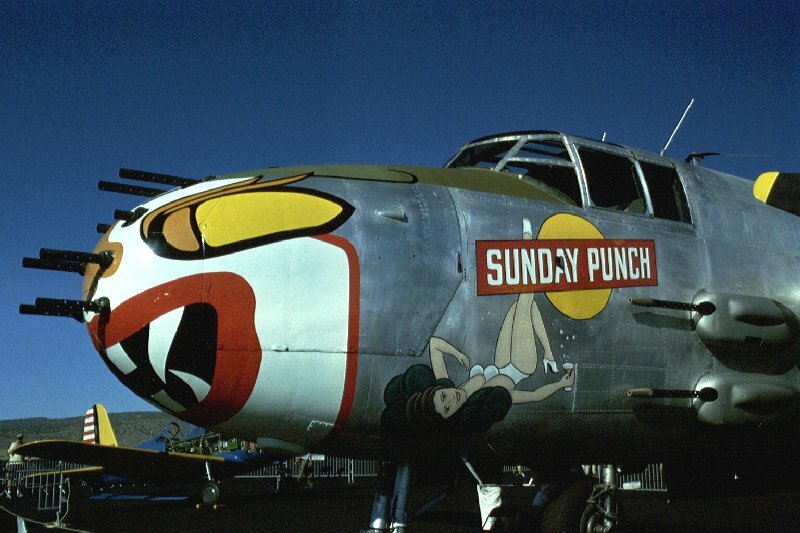 Another look on the sumptuous weapons of the B-25J "Sunday Punch" in the side view. 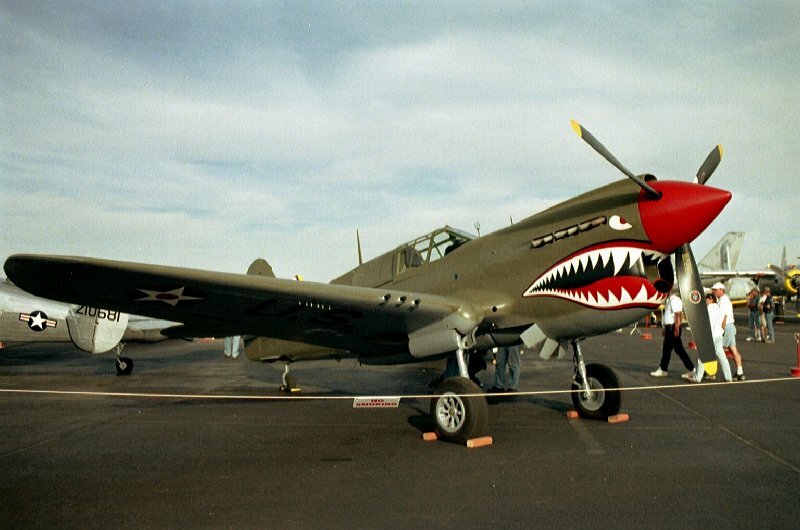 Since the movie "Pearl Harbor" everyone knows the Curtiss P-40 Warhawk. 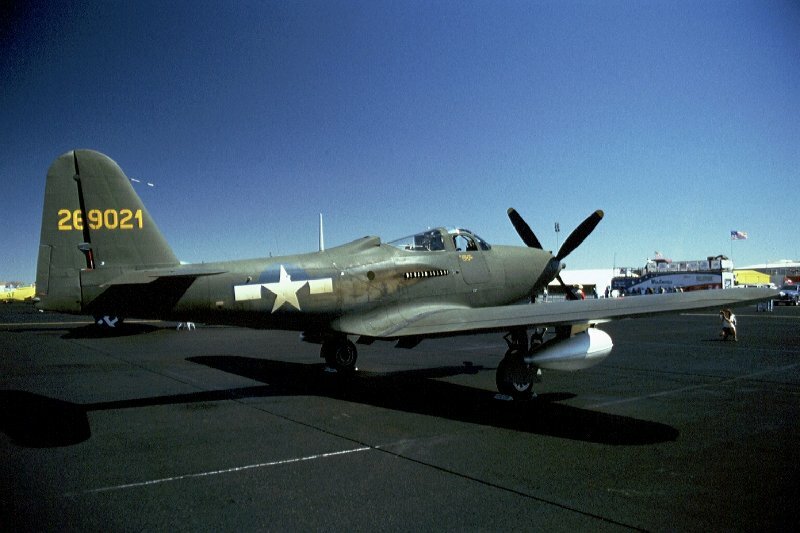 This very tough plane was the standard fighter aircraft of the USA at the beginning of WW 2. 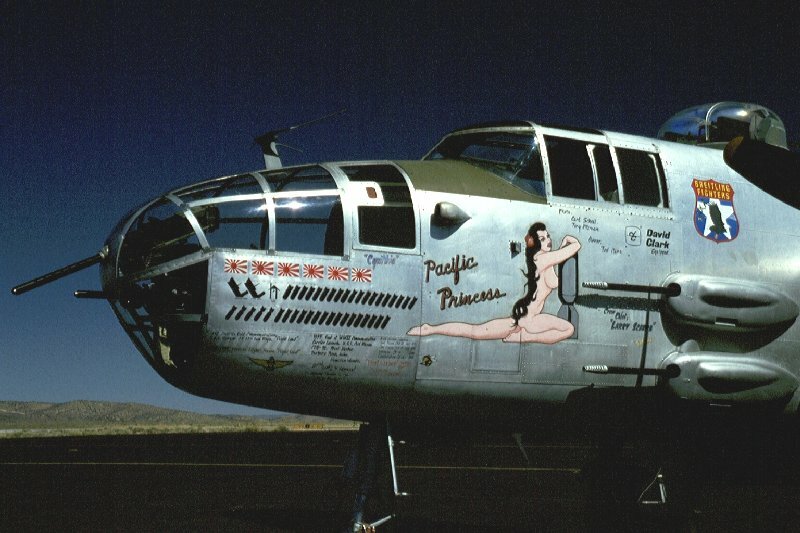 Again a B-25J, the "Pacific Princess" on the apron. 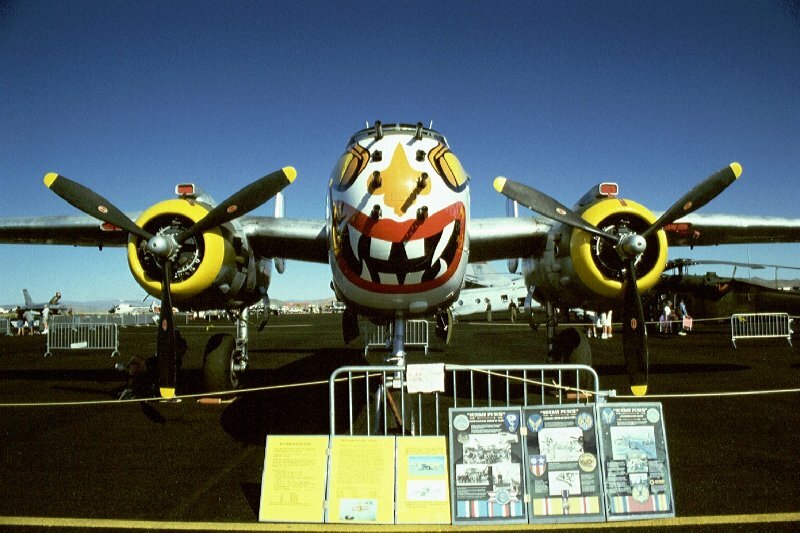 This plane became famous for the retaliatory strike on Tokyo under the command of Col. Jimmy Dolittle. 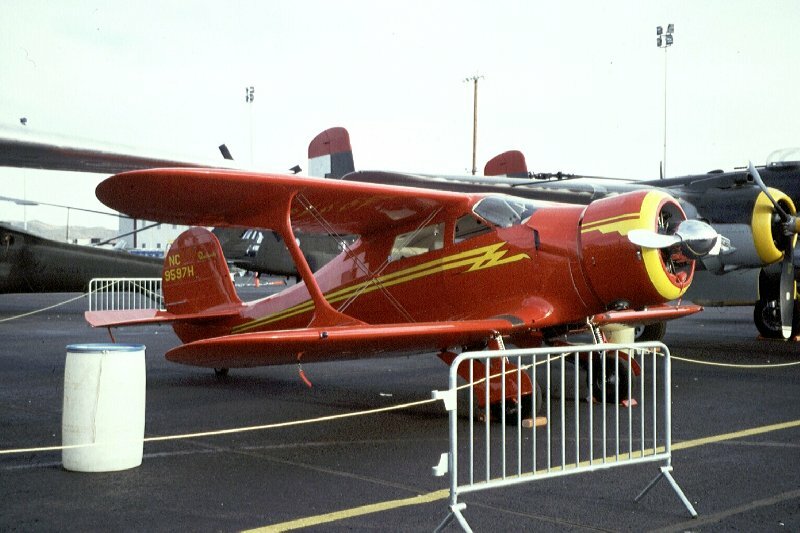 In the year 1940 this Beech D-17S "Staggerwing" did cost around 18.000 US$. With it´s R-985 Wasp Junior 450 PS engine it could reach cruise speeds of 200 mph. Unbelievable that this medium bomber was able to take off for the "Tokyo Raid" from the aircraft carrier USS Hornet. 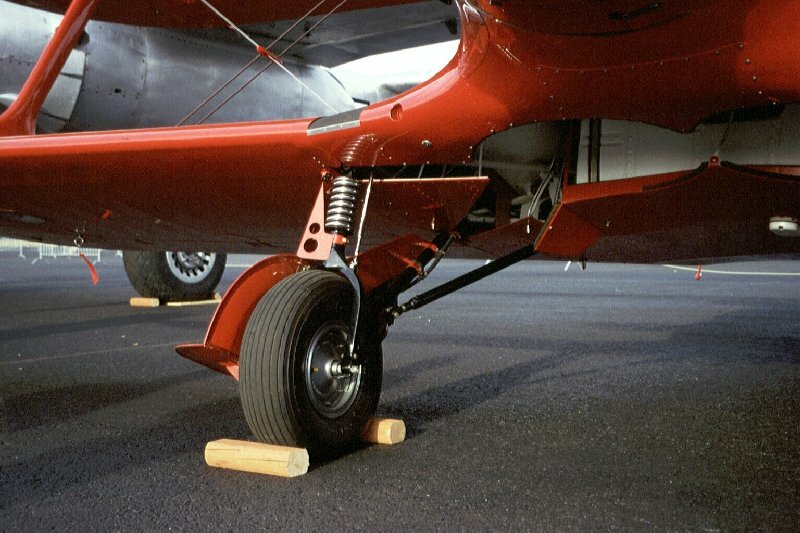 The Staggerwing was one of the fastest airplanes of this type due to the retractable gear. Not even the smallest oil stains or dirty marks would harm the beautiful appearance of this restored plane. A third "Mitchell" could be seen in Reno - the "Executive Sweet". 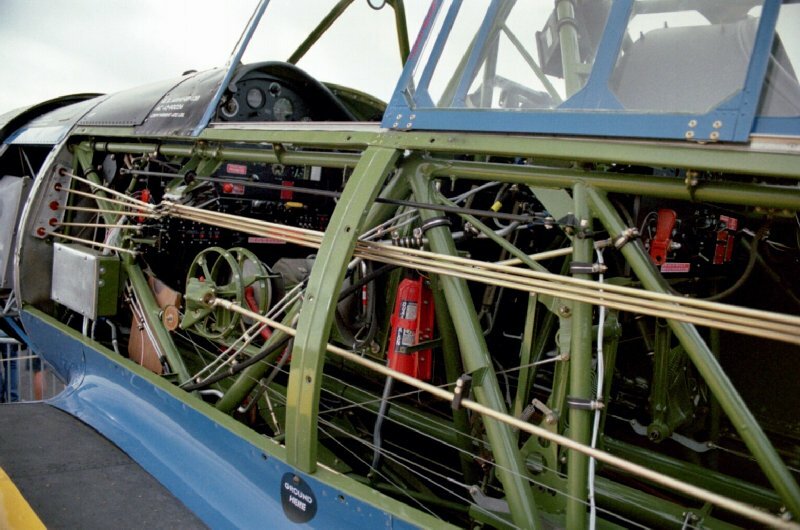 On a closer look the excellent condition of this aircraft could be admired. Replicas are not allowed for the RRHeritage Trophy. Nevertheless Jim Wright with his replica of the legendary Huges H-1 Racer was an attraction in Reno. Sadyl this plane got never into my "striking distance" for some better photos and so I hope for better luck on the next occasion. 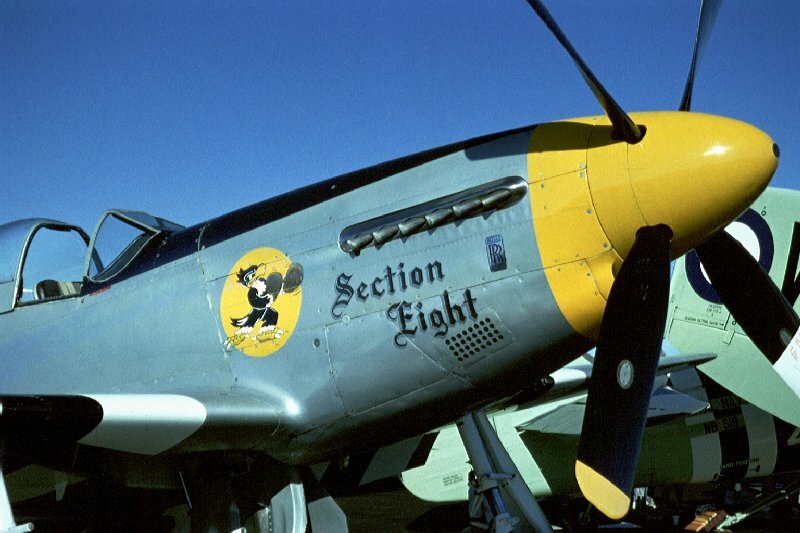 The P-51D "Section Eight" didn`t fly in the races and instead took part in the RR Heritage Trophy. But against the Kingcobra and the Firefly it didn`t have a chance.